Visit Barn World at www.BarnWorld.com today and see our large selection of hog feeders, pig feeders and all of our livestock supplies. Barn World offers the top of the line in hog and pig feeders. Big Wheel feeders provide fresh feed on demand for pigs and sows. Different models are available for farrowing sows, pigs in the nursery, finishing hogs and pigs in wean-to-finish facilities. 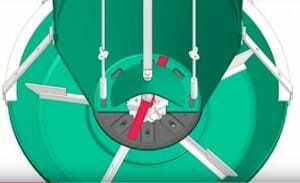 Mechanical flow delivers feed only when pigs want it. Pigs turn the feed wheel and feed is dispensed in the trough. Numerical feed rate adjustment makes it easy to set uniform feed flow in the entire barn. Bump bars agitate feed when pigs turn the feed wheel, preventing bridging of finer feeds. Feeder will not	rust, rot or corrode—hog lot and confinement pen acids have no effect. The Big	“O” Polyethylene Base will fit most sizes of feeders. An adapter ring is used to fit others. Do not throw away that old feeder with the rusted-out bottoms. Bolt the top half of your old feeder to a new big “O” polyethylene base. Save big dollars!!! Includes: Polyethylene base, trough a hopper, poly skids, painted steel supports, side feed adjustment. Add packages to bases (40 BUSHEL FEEDER 1 ROW, 65 BUSHEL FEEDER 2 ROW, or 90 BUSHEL FEEDER 3 ROW) to make complete feeders. Includes: Polyethylene base, trough a hopper, poly skids, painted steel supports, side feed adjustment. 40, 65 and 90 bushel feeders include galvanized sidewalls, 12 feed stations, and polyethylene cover. Note: The use of high fat feeds (in excess of 4%) may require that the grind and/or type of fat additive used be adjusted to promote flow ability. Includes: Polyethylene base, trough, hopper, poly skids, painted steel supports, side feed adjustment. 40, 65 and 90 bushel feeders include galvanized sidewalls, 12 feed stations, and polyethylene cover. Includes: Polyethylene base, trough a hopper, poly skids, painted steel supports, side feed adjustment. 40, 65 and 90 bushel feeders include galvanized sidewalls, 12 feed stations, ladder and polyethylene cover. Hog Feeders and Pig Feeders from Barn World. All your hog feeders and pig feeders are at Barn World! BarnWorld has a great selection of hog feeders. We offer both gravity feed pig feeders and ration style hog feeders that minimize wasted feed. In addition, we have many different sizes of hog feeders to accommodate the different needs of nursery pigs, grower pigs, and finishing pigs. 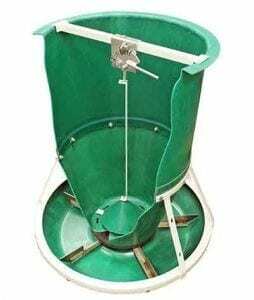 Hog feeder sizes range from 2 bushels to 90 bushels and come in indoor and outdoor options. All BarnWorld hog feeders are made from materials that are impervious to acids from hog waste and will last and last. Advanced scalloped trough design saves feed. 12 large openings “natural” to hog anatomy. Keeps feed in the feeding zone where hogs can get to it. Long-lasting trough is heavy galvanized 12 gauge steel warranted. Largest feed-saver fange on the market. Convenient top-crank feed adjustment with four rigid 5/8” adjustment tubes. All Supreme Feeders are available without top lid and/or doors. The Big	“O” Oscillating Feeder Polyethylene Base will fit most sizes of feeders. An adapter ring is used to fit others. The indoor feeders will manage 35-55 pigs. You can see our entire selection of indoor feeders and livestock equipment at BarnWorld.com. You can see our entire selection of indoor feeders and livestock equipmentat BarnWorld.com. Pig Feeders and Hog Feeders from Barn World for all your pig feeder and hog feeder needs.